The San Juan Mountains loom over a 4,000 square mike area in the Southwest corner of Colorado. 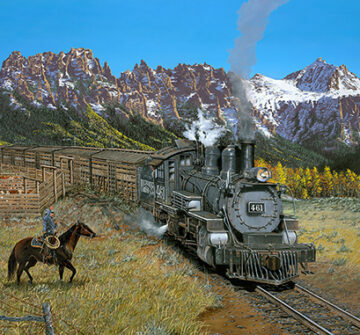 It was upon this rugged terrain that Otto Mears (dubbed the Transportation King of the San Juans) nearly single-handedly oversaw this 172 mike of track for the Rio Grande Southern, the most spectacular mountain railroad ever attempted in America. The RGS circled and crawled over four mountain passes between Ridgway and Durango, tapping Rico and Telluride, and many other mining towns and crossing the highest point at 10,250 feet at Lizard Head Pass. 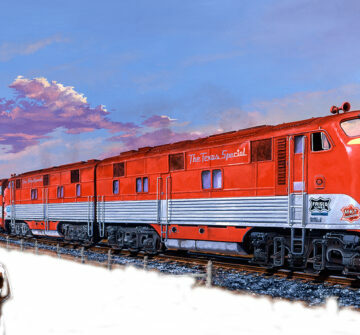 For sixty years (1893 to the early 1950’s), the Rio Grande Southern Railroad carried the economy of the San Juans. The annual autumn stock rush saw frequent and long double and triple headed trains which earlier had carried the precious minerals of the land, then longhorns and later the “wollies” (sheep). During the end of the 19th century the region proved to be one of the largest cattle-producing areas in the state of Colorado. In the fall of 1951, the final stock season for the narrow gauge line came to an end. 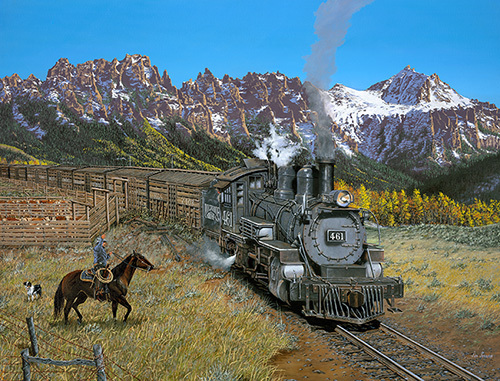 The 461 “mudhen” works a stock extra over from the Dallas Divide. Cowboy and dog bid a final farewell to this rugged train era.